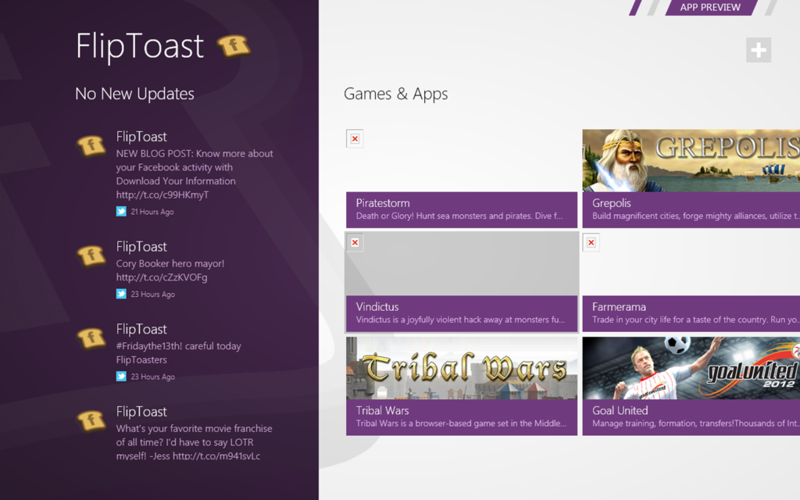 A new Social App FlipToast debuts in the store today. 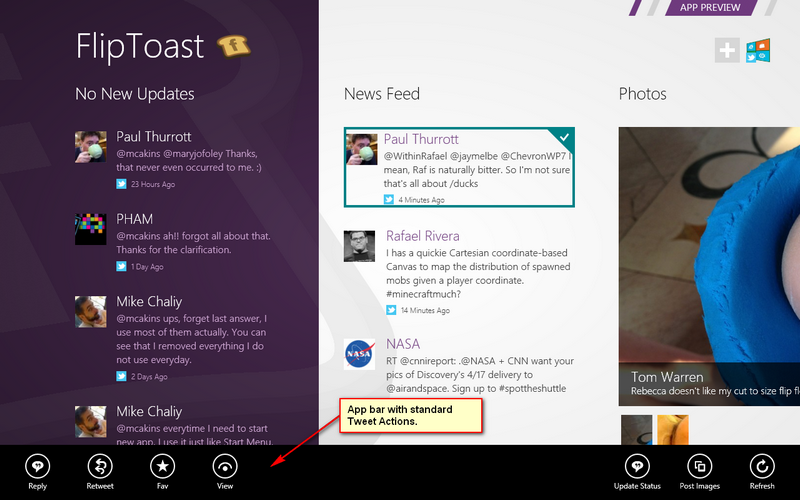 It is the first social Metro App for Twitter and Facebook in the store in this category. 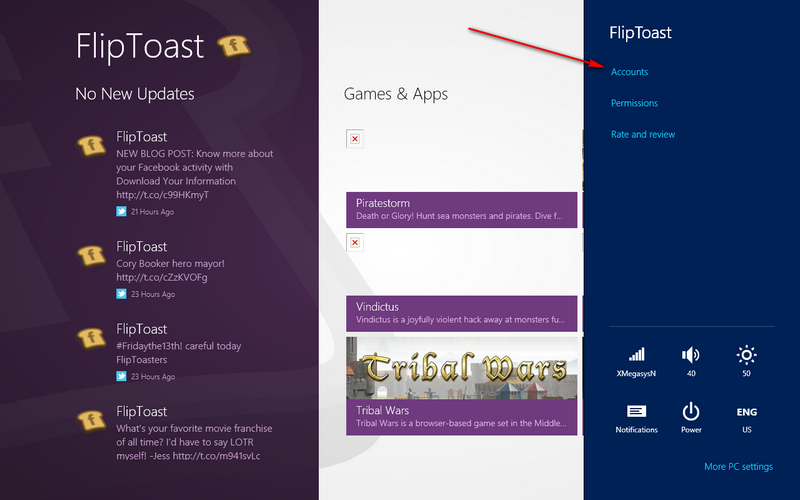 I am sure we will see a deluge of this type of Applications later in this category, but for now the category is the most missed category in Windows 8 Store. So anything will do as for now. FlipToast is a rarity in that carries a baggage of Games Ads in house. I can’t still make up my mind whether this is a genuine Social App, or just a gimmick for an Ad company to sell their wares. I am still learning what this app have in store, but for now I can only see my Twitter Mention column, News Feeds, Twitter Inbox and I can post new tweets. I haven’t linked it to my Facebook account yet. You notice immediately this app is still a work-in-progress as there are flaky things noticeable. 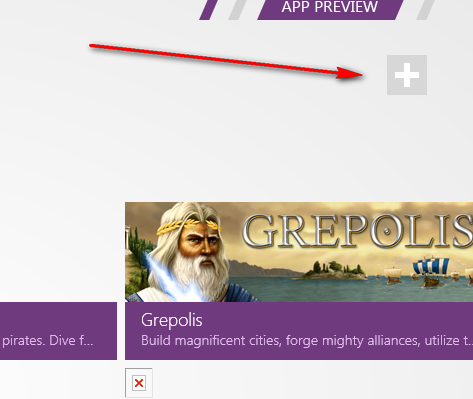 For example, columns, Icons and images failing to refresh properly. You can pan the application horizontally with touch or mouse. It must be said that this App unlike most third-party apps in the store at the moment supports mouse horizontal scrolling. Scrolling is generally smooth, I am yet to find any complaints. If you’ve linked to both Twitter and Facebook, you can click on the “News Feed” to filter which feeds are shown in the news feed column. Note the “App Preview” warning at the top that informs you that this app is still a work in progress. For example, URLs in tweets are not clickable yet, if you click on the tweet’s name, it takes you out to IE10 Metro to view user’s posts. Also there is no clear way to select a tweet for retweet/reply etc with just the touch. With a mouse you just right-click the tweet and it is selected, and the app bar comes up with which you can perform the standard actions on a tweet. If you are using touch only, just touch and hold for a few seconds to activate right-click and perform your standard actions. At the moment there is no way to view you Lists etc, this may come in future updates I am sure. Well this is my intro to the first Twitter/Facebook App in the store. It is rather a simple app for now. It makes much use of IE for secondary view. Hopefully the competition will break loose shortly so that we may see Killer social Apps. As for me I am waiting for Metrofied MetroTwit app. I have seen the future, the future is Metro. Letop: The Apps I mention in my blog posts are not yet visible in the Store. You need to open the Store and bring up the Charm and do a search to find this applications. Hey @McAkins – thanks so much for writing this review on FlipToast! I’m actually the owner of the product. Yes – the app is definitely in beta and we’re already working on a shiny new version that should be available early May. I appreciate your feedback on the ‘adware baggage’ you’ve mentioned. Even though that was definitely not our intention, I can see how the app may come across as being a gimmick of an ad company. FlipToast was born in a company that historically has done in-app advertising. However, we are definitely sensitive to what users want. My vision with FlipToast is to provide users a personalized experience of their social graph based on their likes, follows and interests. A small part of this vision is to provide users app recommendations as well – and Irealize adding a bunch of games from the get go was probably not the best idea. Thanks for sharing your feedback. If you want to reply, retweet, like or comment posts, you need to press and hold the post for a few seconds – this will result in the post being selected and the appbar comes up which will give you the ability to perform the desired action. I’m hopeful and confident that our next version will be THE killer social app that you are waiting for – would love to hear your comments on that once we’ve released. 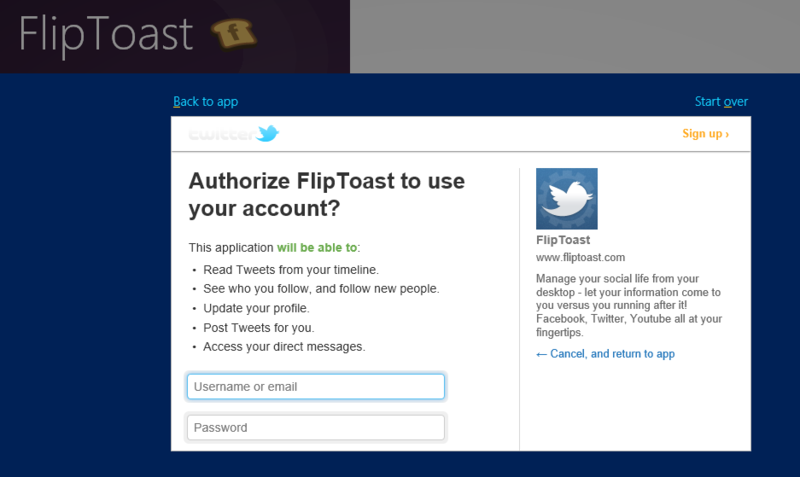 Please let me know if you have any other questions or comments about FlipToast. Thanks for taking the time to respond to the post. I am glad you’re positive about the criticism on the In-App Ads. Of course you’ll need to make a living, but I am sure by the time Windows 8 goes gold, people would have woken up to the advantages of Metro, which may make Windows 8 a viable platform to sell your App. I for one know I will pay for a good app, so may eventually you may not need an in-app revenue scheme. With a billion potential buys on the Windows platform, I am sure indy developers like you will make a fortune. Since your app is the only Twitter/Facebook app that I know of at the moment, I have taken to the experiment of staying fully within the Metro environment and use your app for my social needs. I can tell you that you’ve got a good idea there in the App. 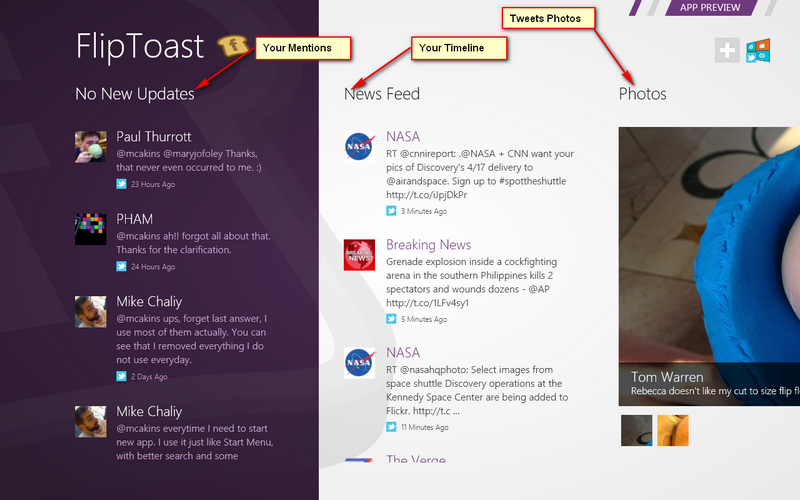 Your ability to merge my Facebook and Twitter stream in one News Feed is a welcomed feature. Of course the app still need polishing, so I am looking forward to your next version. Keep me updated on your progress via my Twitter account. Let me know yours so I can follow your development and give you direct feedback. I hope your next version will use the external IE less and bring more feature. Waiting to hear from you. Great thanks McAkins! Am glad we’re able to satisfy your social media needs for now. We developed our first version in less than a month while learning how to create a great app that satisfies the user experience on Metro. – and yes, we are working as we speak on polishing up the app and taking advantage of the powerful metro features for our next version. Thank you for all your feedback and helping us make a great app! My twitter id is: @sk_shivani.